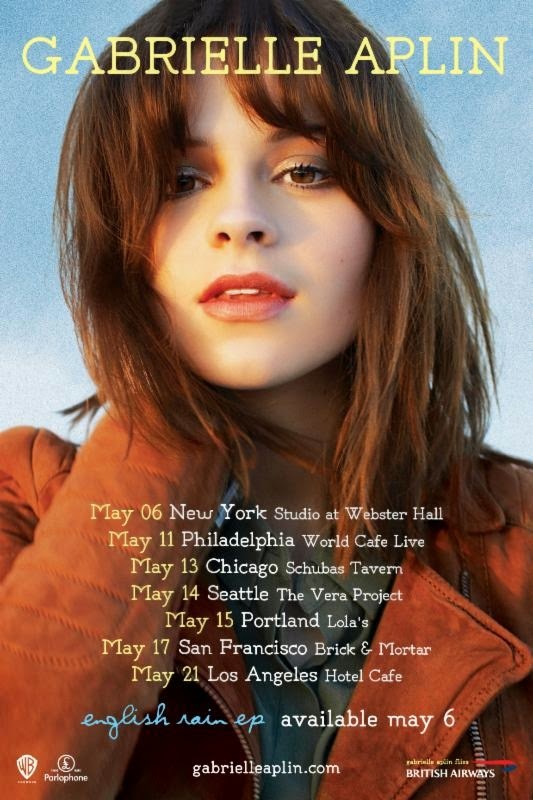 May 6, 2014 - British chanteuse Gabrielle Aplin's 6-song English Rain EP is out today! The digital release marks her U.S. debut and follows her massive success overseas where her single "The Power of Love" has achieved certified Gold status in the U.K. and Australia. Aplin's first ever U.S. tour kicks off tonight in New York City at the Studio at Webster Hall. See below for a full list of confirmed dates. The English Rain EP features five tracks from her celebrated Gold-selling debut album English Rain, which peaked at #2 in the U.K. during a chart-run that lasted almost five months, yet has not been released in the U.S. In addition to "The Power of Love," which launched to #1 on the U.K. and Australia iTunes chart and was featured in promos for ABC's new hit series "Resurrection," the EP also features an exclusive new track - a gorgeous rendition of "A Case of You" by Aplin's musical hero Joni Mitchell. ELLE.com is exclusively premiering the video. A self-taught musician, Aplin has been writing and recording songs since she was fifteen, and, as such, she wrote or co-wrote all of the original songs featured on the EP. Growing up in a self-confessed 'hippy' household where music was a family staple, she honed her craft listening to Joni Mitchell, Bruce Springsteen and Nick Drake. At the age of 17, she set up her own label, Never Fade Records, and went on to release three U.K. EPs, all of which charted on iTunes. Her YouTube channels are now approaching a staggering 57 million views, and for her premiere U.S. release, she's crafted a selection of simultaneously timeless and of-the-moment anthems. Throughout the past year, Aplin has toured with John Mayer, Ed Sheeran and Gotye, performed at festivals including Glastonbury, T in the Park, and iTunes, among others, and headlined a sold out U.K. run.